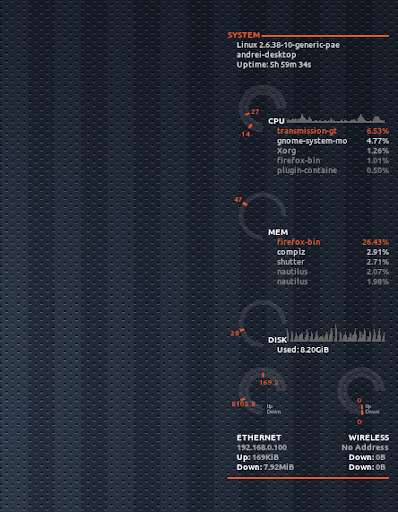 Conky Lunatico Rings is a really nice Conky configuration based on Conky Orange which displays rings for the CPU, memory, disk and network usage, in the form of gauges. You can download Conky Lunatico Rings from HERE. But maybe the original Conky Lunatico Rings works better on your computer (it's most probably related to the font configuration) so try the original firstly. If you want my tweaked version, you can get it from HERE. But you can of course tweak it some more by yourself, it's really not that difficult. 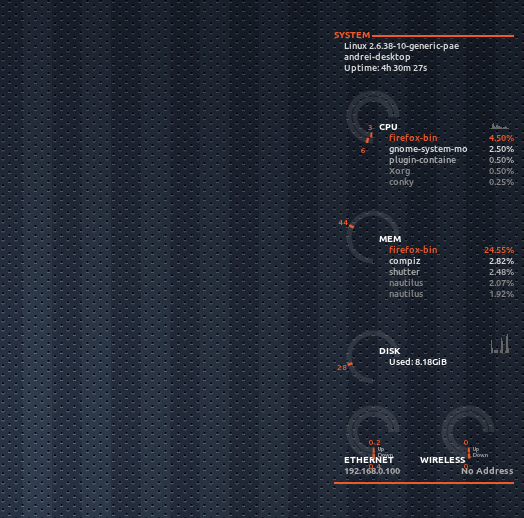 To use Conky Lunatico Rings, you'll need to install the Ubuntu font - this is already available on your system if you use Ubuntu 10.10+ or you can manually download it from font.ubuntu.com. Then, download Conky Lunatico Rings (links above), extract the downloaded archive, create a folder called ".conky" in your home directory and move the "conky_lunatico.lua" and "conkyrc_lunatico" files into this folder. Where "YOUR_USERNAME" is yes, your username :) This will delay the Conky startup which is required for it to function properly. 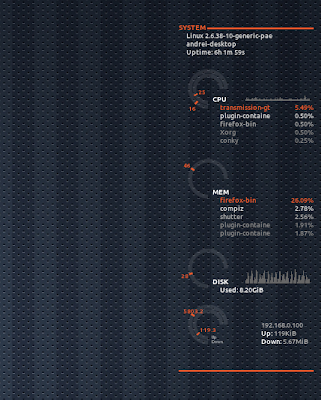 For more Conky configurations, check out our Conky tag.